Here in Lanesboro we have a documentary film event on the 3rd Friday of every month during the tourist season (May-October). Since I am smack in the middle of the 10-week process of raising 8-pound pastured Cornish Cross chickens on locally sourced organic feed, when I heard about the new documentary film, American Meat, I immediately thought that the new film might be a timely, hot draw...at least for me. 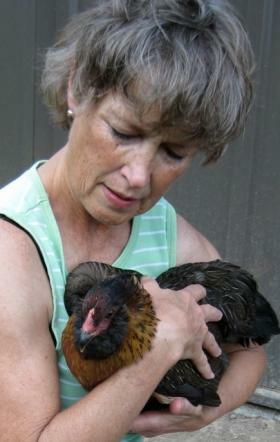 Raising meat birds myself and having many friends steeped in agriculture, I am immediately drawn to anything regarding sustainable animal husbandry. One such acquaintance, Catherine Friend started out a very reluctant farmer, learned to love her rural lifestyle and wrote about her farming experiences in her best-seller Hit By a Farm. More recently she wrote The Compassionate Carnivore and gave the book an intriguing subtitle: How to keep animals happy, save old MacDonald’s farm, reduce your hoofprint, and still eat meat. I was curious to see how American Meat would fit into the conversation. American Meat left me quite the endearing feeling towards today’s small, sustainable farmers. The movie showed the many admirable traits of the small farmer: their inventive nature, willingness to work hard, concern for the greater good, sense of humor, respect for past traditions and care for the sustainability of their land. When I previewed the film last night, I was especially impressed by its tone. It was upbeat, yet realistic, pondering the future supply of beef, chicken and pork. It looks at innovations and attitudes that are changing farm practices and prospects across the country. More importantly for me, it posed a fascinating question: Are you one of the 4 million Americans who’ll heed the call if we all want pasture-raised beef, chicken and pork on our dinner table? Indeed, for a subject that could be really negative I found American Meat a lift – a documentary that invites anyone and everyone--young people especially--to consider becoming happy, healthy, sustainable small-scale farmers. I loved seeing the profiles of successful farmers (including Chuck Wirtz of West Bend, IA and Joel Salatin of Omnivore’s Dilemma fame) who, against difficult odds, invented practical ways to raise pastured meat and still keep their heads above water. These farmers, like so many in Minnesota, have farmed their whole lives. They love the work that they do and the animals they raise. The film is certainly one of the hot topics in the food world of cinema and is scheduled widely in our home state. In Lanesboro, we are set for a screening on Friday July 20, 7:30 pm at the St. Mane Theatre in Lanesboro. It’s also showing soon in many more locations in Minnesota, including Rochester, Winona, Northfield, St. Paul, Edina, Wykoff and St. Cloud. 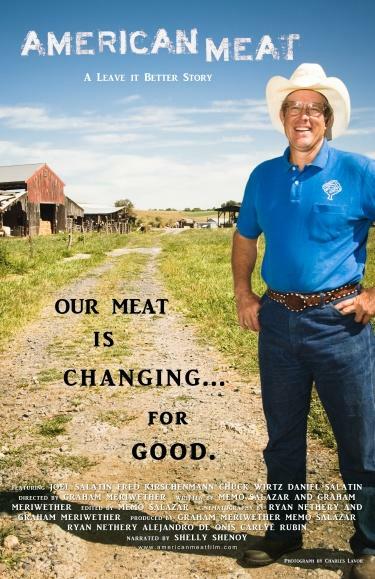 In Lanesboro our film event begins with a tasting of locally raised meat at 6:30 pm at Lanesboro Local Marketplace. Then at 7:30, the 82-minute film will be shown across the street at the theatre. Following the film, Paul Wiens of Misty Meadows Farm in Pine Island will draw on his experiences to lead a discussion of small-scale animal farming. For those of you in the Twin Cities, there is a special treat regarding the Edina Cinema showing this Thursday, the 12th. Lucia of Lucia's restaurant will be serving some great food from local farmers from 5:15-6:15 before the 7:00 screening of the film. Click here for more information. For more information about the Lanesboro Third Friday Documentary Series leave a comment here or contact the Lanesboro Arts Center at 507-467-2446. Kitty Baker grew up on a mixed ag farm, then in a small town, near Rochester, MN. She and husband Keith raised two daughters, living in Kansas City and Minneapolis. A professional writer, Kitty enjoys topics of lifestyle and food, especially since 1999, when they bought a farm, Root River Wilds, just north of Lanesboro, MN. The farm’s spectacularly varied acreage -- bluffs and woods, pastures and restored prairies cut with trails and wrapped in the oxbow of the North Branch of the Root River -- is rich with opportunities to discover and share ways to live abundantly. Her last article for SGT was: Straw Bale Gardening.